To feel the atmosphere of St. Petersburg, you do not have to immediately go here: it's worth starting with the films that were shot in its borders. These films are immersed in a unique urban environment, filled with cast-iron bars of bridges, granite embankments, narrow courtyards and wide squares. Viewing such a movie dipped in the St. Petersburg interior, inspired to visit the Northern Palmyra. There are a lot of wonderful films created in St. Petersburg, where the city, it would seem, plays one of the main roles. Quite an original, but beloved by many a film, which is a half-hour walk through the sun-drenched Petersburg. In the center of the story are two young men and a young girl. Their acquaintance takes place on one of the streets of Petersburg, and soon their communication flows into a melodrama, passion in which and boil. A storm of emotions overwhelms the trio on the way from the St. Isaac's Cathedral to the Palace Square. The walk looks naive and serene, but it seems like a lifetime passes through it. The trio's promenade, full of laughter and smiles, turns into tears and disappointments, waiting for an unexpected and bright finale. This movie especially in that it was shot in the Winter Palace with only one cadre for a single take, which lasted 1 hour, 27 minutes and 12 seconds - the timing of the film. The camera was never stopped, and the shooting was not subjected to editing. This picture was the first in the history of Russian cinema in its own way. The plot of the picture tells of two travelers who find themselves in the Winter Palace: the French marquis and the young Petersburger. Heroes talk throughout the movie, discussing with interest all that they encounter on the way, but most of the time the characters remain off-screen. Cinematographic almanac, which consists of separate short films, the main figures in which are Petersburg women. The film was also screened by great women: Oksana Bychkova, Renata Litvinova, Aksinya Gog, Anna Parmas, Natalia Kudryashova, Avdotya Smirnova and Natalya Nazarova. Women in the film communicate directly with the city - St. Petersburg takes a direct part in the fate of their heroines. St. Petersburg - a city in which it is easy to fall in love. It's easy to decide on a risky adventure, try something for the first time or go all-in. The film consists of several short stories that unite only three themes: St. Petersburg, love and love for St. Petersburg. The city is indeed one of the heroes of the picture, taking the most direct part in the plot. According to the plot of the picture abroad, a Russian emigrant dies. She tells her granddaughter that her rich inheritance is hidden in Leningrad "under the lion." Therefore, Olga flies to Leningrad, but she flies not alone: ​​some people have overheard the conversation of the grandmother with her granddaughter. In total, a prestigious physician, the leader of the Italian mafia, two orderlies, an occasional townsman and Olga herself come to the Soviet Union. In Moscow, this company is also supplemented by a "guide" , which only complicates the complex search of the inheritance. So start an amazing adventure. A professional translator and an esteemed person of 46 years old named Andrey Buzykin has a fine career, but his personal life does not go well at all. Andrei Pavlovich in a difficult situation: he can not choose between his own wife and a young mistress. Being a weak-minded person who does not have his own opinion - or at least his perseverance to express and protect - Andrei is torn between two flames. Painfully familiar history, taking place against the backdrop of the streets of Leningrad in 1979, will touch the soul and heart of any spectator. The plot of the film revolves around a young pioneer who lives in a communal apartment on Vasilievsky Island. He often finds himself in amazing and absurd situations. The boy is always unlucky, but he calls himself lucky. His childhood is not without problems, but he does not lose heart, loving sincerely and laughing heartily. The film flashes the wonderful streets of Vasilievsky and the embankments of the Neva. The film will tell you what the boys did in the 30s, as they used to be friends in the yard and where happiness was obtained. The main heroine of the film named Masha works on the radio, and Maxim comes to Petersburg from Nizhny Novgorod. Young people are not familiar, but very similar: both clumsy, inattentive and dreamy. Each of them stands on the verge of a significant event in his life: Masha is getting ready to get married, and Maxim plans to go to work in Germany, winning in an architectural competition. Once Maxim and Masha collide in the crowd, and Masha drops the phone, and Maxim finds it. He decides to return his owner, but by chance, they always pass by each other, unable to meet. A good story about the girl Lena from the rich Moscow family, which suffered a string of failures. At some point, she sees that her life is rolling downhill and, not finding support in others, she goes to Petersburg in order to start living anew. Meanwhile, in St. Petersburg in an abandoned janitor 6-year-old Cuca lives - a girl with a sad fate. When Lena and Cuca meet, they soon realize that this meeting was fatal for both of them. Lena decided that Cuca needed help, but soon it became clear that this Lena needed the help of a girl. Over a stunning view of white nights in St. Petersburg, a lot of tourists flock to every summer. The film tells about this amazing time, when Petersburg was still called Leningrad, but the white nights were still as beautiful and mysterious. On one of these bright nights, an unexpected acquaintance between the Russian composer and the Japanese pianist happened. But the happiness turned out to be just as fleeting as the short northern summer. Only a year later, life again gave them a chance meeting, but now in the Japanese city of Kyoto. The main character of the story was Joseph Brodsky. The film includes a combination of artistic and documentary shootings, as well as animation inserts. The plot revolves around the touching story of the poet's life, his emotional unrest and relations. The leitmotif of history is the dream of returning to his homeland, to beloved Leningrad, where Brodsky's unclouded childhood passed, as well as a bright youth and rich maturity. The plot of the film begins in a compartment of a train traveling from Moscow to St. Petersburg, where the acquaintance of two girls begins: one of them is a Petersburger, a research fellow of the Kunstkamera, a divorced divorcee in marriage, and the second is a breezy and sociable administrator of a nightclub from Yekaterinburg. The girls suddenly disappear bags with documents and money, so that their fate again reduces: Lisa from St. Petersburg invites Vika to stay at home for a while. This is how the great and strong friendship of two lonely and so different women begins. Cinema tells about the Petersburg artist-designer Platon Andreevich, who dreams of the continuation of human life in art. Being the author of beautiful mannequins, he dreams to create something eternal and indestructible - for many years he raved about the idea of ​​fighting with the Almighty. In the end, the artist's dream comes true and his creations find life. However, this did not happen at all as Plato imagined. A cult film, narrating about the hard and gloomy 90s, atmospheric and "kamerno" shows autumn Petersburg with gray and dank streets, cold embankments and eternally overcast skies. A criminal drama about the hero of our time unfolds before the audience the real tragedy of a modern man, interwoven history with elements of an action movie. The picture is a success not only in Russia, but also abroad. Melodrama talks about the uneasy relationship of a young couple - journalist Valery and working girl Nina. Seeing off the white nights, the young Nina meets Valeria and immediately sincerely falls in love with him, not realizing that for the guy she is only a page in the long book of his love successes. The leitmotif of the film was the natural background of the city landscape and the Neva embankment. 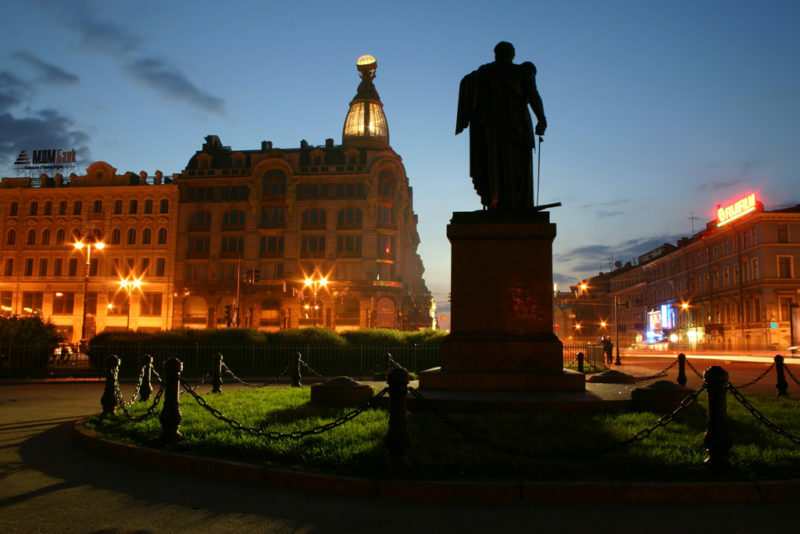 White nights and Petersburg once again became the title characters . Another film about the white nights in the city on the Neva. The movie duplicates the plot of the 1969 film, showing the love story in a new light. Young beauty Nina gets acquainted with the promising Valery, who works as a journalist. The story of the first love is familiar to everyone, so that every spectator can find a response in his feelings, watching the heartbreaking drama that unfolds against the backdrop of the Leningrad landscape. The action takes place in 1860: as a result of the terrorist attack, one of the members of the royal family was killed. A couple of days, Fyodor Dostoevsky meets in a psychiatric clinic with one young guy. He confesses to him about his involvement in the terrorist attack, and also that soon new terrorist attacks are planned. The young man tells all the valuable facts, begging the writer to help him stop the bloodshed. Once the chief bookkeeper Smirnov climbs into the roll of the regulator and prevents the normal traffic on one of the streets of the city. In the meantime, Vasya Shaneshkin, the pointsman , mistakenly delivers to the police station the cashier "Stroitrest" by last name Vodnev, who is in fact a decent citizen. He is also the parent of Vasya's girl, as it turns out later. He admits his guilt, but he does not hurry to apologize. Soon the young sergeant will have a chance to save the cashier from the attempt, and the hero does not neglect his duty. The well-known talented composer Johann Strauss has repeatedly visited Russia in the 19th century. He gave concerts in the neighboring suburb of Pavlovsk, which always enjoyed a noisy success. In memory of a happy journey to Russia, the musician created his famous waltz "Farewell to St. Petersburg". The film tells about the stay in the country of Johann Strauss, as well as about his concerts and sincere love for the Russian aristocrat Olga Smirnitskaya, to whom the composer often devoted his compositions. Elliot - a 25-year-old Englishman who quit teaching dance in Oxford, makes the decision to start life from scratch. To this end, he went to Petersburg to his brother Fedor, whom he had never met before. Here, Elliot teaches a girl called named Anya, who is preparing to enter the Theater Academy. Elliot has only 7 days to teach her to dance and deal with feelings. Whatever movie you choose, rest assured that each of them is imbued with a spirit of St. Petersburg. After all, each picture was shot in the natural scenery of the unique landscape of St. Petersburg, whether it was overcast or sunny in those days. Each film is a small journey not only to the world of history, presented by the plot, but also to the atmosphere of the Northern capital with its embankments, bridges, lanterns and granite pavements.